Kelly Franz moved to Charleston in 2002 to attend the Culinary Institute of Charleston. 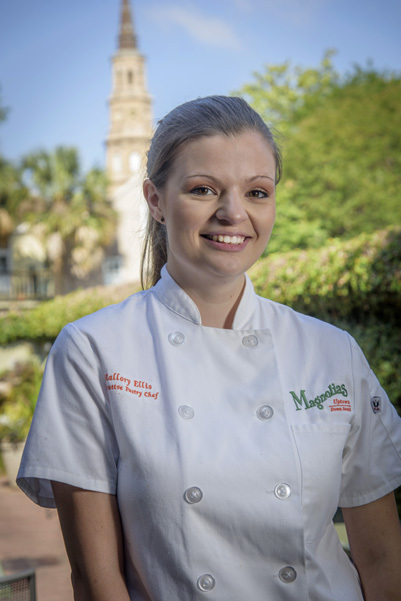 While working toward her degree, she joined Magnolias in November 2003, became sous chef in 2005, chef de cuisine in 2009 and most recently executive chef in 2015. 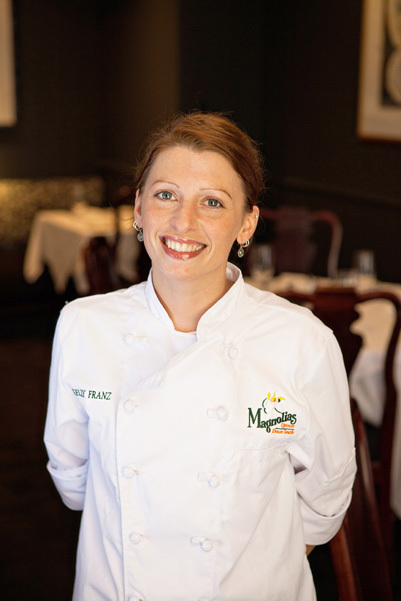 Her strong work ethic and leadership abilities set Franz apart in the kitchen. These skills—which she attributes to her mentors at Magnolias—coupled with her proficiency, quickly moved Franz through the ranks. Franz’s current roles include overeseeing various kitchen stations, ordering and cost control, hiring, seasonal menus, recipe development and more. Growing up in a military family, traveling often meant experiencing different cultures and food and her time in the kitchen began early when she would help her father cook Sunday brunch. Food became a passion of hers, where even grocery shopping was for fun. While working as a server at Key West Grill in Columbia, S.C., Franz was always more interested in what was happening in the back of the house. She began helping with food preparation and this soon became her favorite part of the job. After transitioning into the kitchen, she discovered her passion for cooking and decided to pursue a degree in culinary arts. While attending the Culinary Institute of Charleston, Trident Technical College, Franz spent time growing in beloved kitchens in Charleston including Locklears, Angelfish Restaurant and Magnolias. In 2015, Franz was invited to join the Charleston Chapter of Les Dames d’Escoffier and is honored to be apart of this distinguished group of ladies in the hospitality industry. Also in 2015, Franz was runner-up in season 6 of the Food Network’s Cutthroat Kitchen and Bite Club with Tyler Florence in 2018. Since 2016, Franz has actively been involved with One80 Place RISE (Raising Individual Skills for Employment)—a program aimed specifically at teaching its residents culinary skills and placing them in jobs within the hospitality industry and Bread + Butter—nonprofit organization aimed at connecting Charleston’s hospitality industry with the community at large through staffing and service initiatives. Franz believes the key to Magnolias’ success is consistency. She strives daily to stay true to the menu staples that so many people travel to Charleston to revisit, while constantly evolving the menu to reflect trends and seasonality. Franz looks up to chefs Donald Barickman and Donald Drake, who taught her the discipline necessary to be a leader in the industry and have pushed her every day to live up to her potential as a chef. She is also proud to have had many of the students who have worked for her at Magnolias become great chefs across the country. 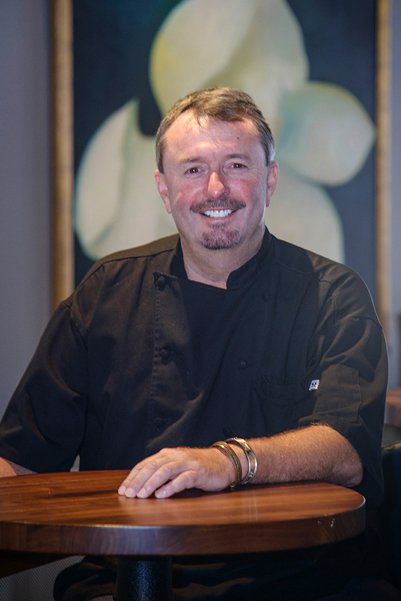 Joining Magnolias as sous chef in 1991, Don Drake continues to be one of the forces keeping Magnolias at the top of the nation's list for exceptional Southern food. Prior to relocating to Charleston, Drake simultaneously attended the Culinary Institute of America and trained under Chef Barry Wine at the critically acclaimed, four-star Quilted Giraffe in New York City. Embarking on a culinary world tour after receiving his degree, Drake immersed himself in global cooking techniques, spending a majority of his time in London, Australia and Hawaii. Notably, Drake worked in Honolulu's celebrated Roy's mastering his culinary skills under famed Chef Roy Yamaguchi. Integrating his international culinary background into the distinctively Southern meals for which Magnolias is legendary, Drake prepares dishes with surprising worldly flavors that remain true to the history and culture of their Lowcountry beginnings. Mallory’s love of baking began as a child, when she would prepare homemade cakes for her family’s table. It didn’t take her long to realize this was something she wanted to pursue as a career. After attending the Culinary Institute of Charleston where she earned a degree in Baking and Pastry and certifications in Food Service Management and Advanced Beverage Service Management, she worked for a family-owned bakery, Butter Blossom, preparing cupcakes and cookies before heading to the pastry department of HMGI’s Magnolias and Blossom. The same excitement from her early days of baking has carried into her current philosophy on cooking: to always create with passion, care and effort. Like her mentor at HMGI, Andrea Upchurch, she hopes to carry the same playfulness in baking as one of the first chefs that inspired her, pastry chef and television personality, Duff Goldman. When not whipping up pastries, Ellis is reading books, heading to a movie, or spending time in the sun and grass.